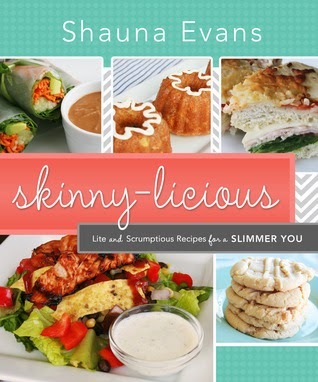 Skinny-licious by Shauna Evans is the latest edition to the Cedar Fort Publishers family of cookbooks. In addition to Skinny-licious, the author has also written Sweet and Savory and the forthcoming 30 Minute Meals for Families, both published by Cedar Fort. In this cookbook, Shauna Evans shares her weight-loss issues and journeys. She follows the 8-Hour Diet Plan created by Davis Zinczenko and the recipes in this cookbook are based on that diet plan. The cookbook includes recipes in four different areas: lunches, snacks, dinner, and desserts. There is also a page at the end of the book that shows you how to create your own flavored vitamin water. Lunch - This section features a number of light lunch recipes including smoothies, soups, salads and dressings, and wraps. You can eat Lobster Rolls, Greek Pasta Salad, and Barbecue Chicken Salad and still watch your figure. Snacks - The snack section of the cookbook features several different dip and salsa recipes. I tested the Cinnamon Sugar Chips with Fruit Salsa. I loved the combination of pineapple, peaches, strawberries, and apples. Delicious! Dinner - These recipe featured lean meat choices and reduced fat dairy products, and many of the recipe feature exotic flavors such as Chicken Coconut Curry, Tarragon Orange Halibut, Stuffed Peppers, and Shrimp Red Curry. Desserts - Yes, you can eat desserts (in moderation) and maintain your weight. Shauna focuses on fruit or dairy based desserts and limits flour-based desserts. This section is filled with many ice cream, frozen yogurt, and ice pop recipes. You can also find more tradition dessert recipes such as Apple Betty and Creme Brulee. If you're in to healthful recipes and want to expand your cookbook collection in this area, you may want to consider adding this book to your shelf. The cookbook features recipes that have a broad appeal and most of the recipes are accompanied by a full-color photo. To learn about Shauna Evans, visit her web site, Sweet and Savory Seven.